Rob is a newcomer to film, but he has gone in with gusto. Rocking two fantastic cameras in this really precise setup. Come and check it out. Hello, Mr. JCH! My name is Rob Mak, and I live in the Washington DC area. I started shooting film about six months ago, and immediately fell in love with both the simplicity and challenge of it. I use a DSLR as well, as I have two young sons (a 2.5 year old toddler, and a 4 month old baby) and want to make sure that I get all the shots – thousands of them, but I find the analog shooting experience so much more enjoyable and creatively stimulating. 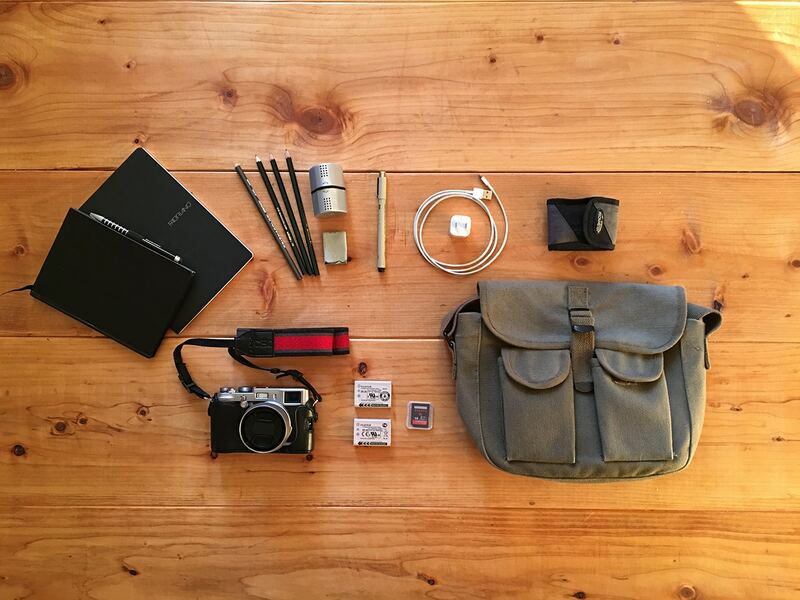 My camera bag dual-functions as my go-to-work bag (I’m a government employee). When I get a break during the workday, I like to grab the camera gear and take a walk with a couple of my co-worker buddies/fellow film enthusiasts and just shoot. It’s zen-like, and a great stress reliever. 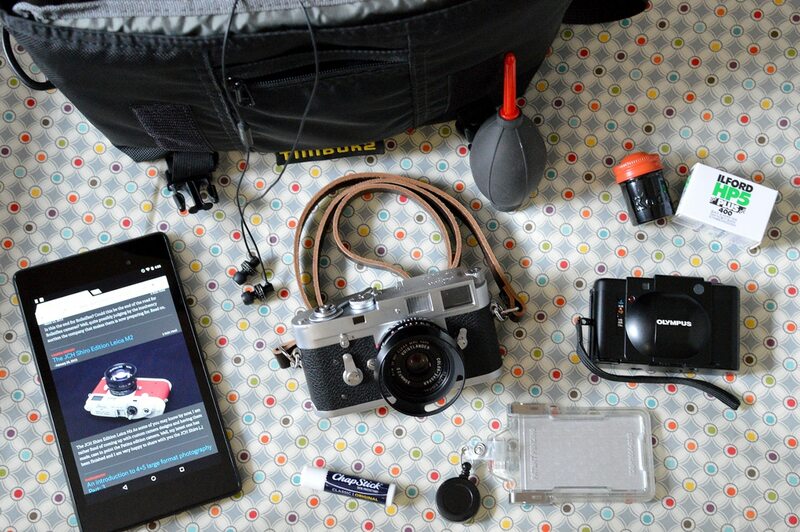 Here’s a rundown of what’s in my bag right now. Timbuk2 messenger bag w/ Tenba camera insert: I’m thrifty, so I just stuck a Tenba camera insert into my Timbuk2 small-size messenger bag, and voila, instant camera bag! I like that this setup is stealthy, being free from any obvious signs of the photography gear inside. Leica M2: These days, my every day camera is a Leica M2, outfitted with a Voigtlander 35mm f/2.5 Color-Skopar PII. This combo is a joy to use, and I just love how tiny the Voigtlander lens is without sacrificing much in terms of image quality. 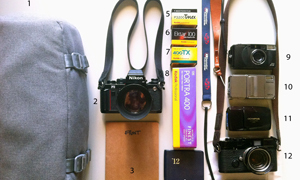 A Figosa brown leather neck strap (www.figosa.it) keeps the M2 safe and secure when I’m out shooting. Olympus XA: When I want maximum pocketability, I leave the bag at home or in the office, and just bring along the little XA. 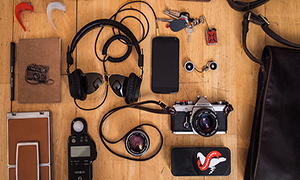 The 35mm f/2.8 lens is plenty sharp, and the aperture-priority makes quick snapshots a breeze. I don’t even bother trying to use the XA’s dim rangefinder patch, and just scale-focus at f/8 and higher instead. 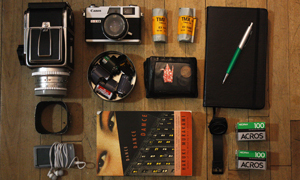 Film: I usually keep one color and one black & white roll in the bag at all times. For color, I prefer Portra 400, Ektar, and UltraMax 400. For B&W, I usually use Tri-X or HP5. I’m still trying different films all the time though, as it’s just so much fun! Oh, and I love using vintage film canisters, like this old-school Kodak one. Air blower: A seemingly minor item, but so very useful. This one is tiny and fits perfectly inside my bag. Chapstick: Because lips get dry, yo. Never leave home without some. Google Nexus 7 tablet: For watching movies on the go, and browsing some of my favorite websites. Skullcandy earbuds: Great for listening to EDM tracks, or for letting the world know I don’t want to be bothered today. Anyway, hope you enjoyed taking a look inside my bag and hearing my story! Thanks for sharing your bag with us, Rob. I love the simplicity of this one. The Olympus is a nice touch.